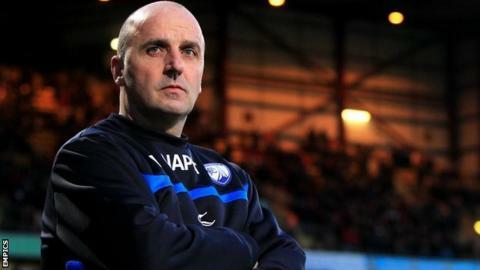 Chesterfield are not thinking of themselves as underdogs for their play-off semi-final against Preston on Thursday, says boss Paul Cook. Cook's side won promotion to League One last season and finished their first season back in the third tier in sixth. Preston had the chance to go up automatically on Sunday but lost to Colchester to finish third. "We'll be considered by most to be the underdogs but we don't think of it that way," he told BBC Radio Sheffield. "You have to have belief in what you do and we deserved to finish where we did in the table. "You can over-complicate what you are trying to do but if we win two games then we will be at Wembley." The Spireites recovered from three goals down to draw 3-3 at Deepdale in September before the Lilywhites won 2-0 at the Proact in February. Cook, who was approached by League Two Portsmouth last month, added that reaching the play-off final would be his greatest achievement since joining Chesterfield in October 2012. "It would mean everything to me," he said. "The lads have been written off so many times this season. When we sold Eoin Doyle everyone was saying where are the goals going to come from but the lads have continually delivered. "They've got one big fence to overcome and if we could get to Wembley it would be fantastic for us all." Meanwhile, Preston boss Simon Grayson said he was "devastated" his side had failed to secure automatic promotion on Sunday. North End had been on an 18-match unbeaten run before they lost to the U's. Preston have endured nine unsuccessful play-off campaigns, the most by any Football League side. "We know an opportunity [was] taken away from us at the weekend because we didn't do what we needed to do," he told BBC Radio Lancashire. "Football has a way of kicking you where it hurts and it is how you respond to things. "We're very positive we've still been given an opportunity to still be promoted."